After decades of research and development, concentrating solar thermal (CST) power plants (also known as concentrating solar power (CSP) and as Solar Thermal Electricity or STE systems) are now starting to be widely commercialized. Indeed, the IEA predicts that by 2050, with sufficient support over ten percent of global electricity could be produced by concentrating solar thermal power plants. However, CSP plants are just but one of the many possible applications of CST systems. 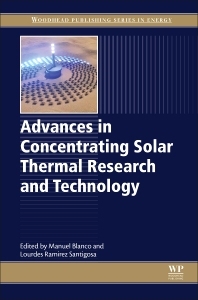 Advances in Concentrating Solar Thermal Research and Technology provides detailed information on the latest advances in CST systems research and technology. It promotes a deep understanding of the challenges the different CST technologies are confronted with, of the research that is taking place worldwide to address those challenges, and of the impact that the innovation that this research is fostering could have on the emergence of new CST components and concepts. It is anticipated that these developments will substantially increase the cost-competiveness of commercial CST solutions and reshape the technological landscape of both CST technologies and the CST industry. After an introductory chapter, the next three parts of the book focus on key CST plant components, from mirrors and receivers to thermal storage. The final two parts of the book address operation and control and innovative CST system concepts. Prof. Manuel Blanco has more than 30 years of experience as a solar researcher and engineer, and has contributed to advancing the state-of the-art of Concentrating Solar Thermal (CST) technologies. He is an expert on Thermodynamics, Heat Transfer, Optics, and Modelling of Energy Systems. He is a Full Professor and holder of the European Research Area (ERA) Chair in Solar Thermal Energy of the Cyprus Institute’s Energy, Environment and Water Research Center (EEWRC). He is also the Chair of the Executive Committee of SolarPACES, the Technology Collaboration Program of the International Energy Agency responsible for promoting the development and deployment of solar thermal power technologies and the solar-assisted manufacturing of fuels and chemicals. Until August, 2016, he has been Science Leader of the Solar Energy Systems Research Group of CSIRO -Australia’s National Research Agency, as well as the Director of the Australian Solar Thermal Research Initiative (ASTRI). He is the former Director of the Solar Thermal Energy Department of the National Renewable Energy Centre of Spain (CENER), Chair and Full Professor of the Engineering Department of the University of Texas at Brownsville, and Director of the Plataforma Solar de Almería of CIEMAT, which is the largest European solar research infrastructure. Manuel Blanco is the author numerous of scientific publications, and participates in a large number of national and international expert groups and committees in a senior capacity. Dr. Lourdes Ramirez Santigosa is an expert on data analysis, mathematical modelling, measurements processes and atmospheric physics. In 1990 she began working in the characterization of solar radiation for energy applications and has played for more than 12 years as a coordinator of the Solar Radiation Group at CIEMAT (Research Centre for Energy, Environment and Technology). She worked at the National Renewable Energy Centre (CENER) leading the Measurement and Characterization Service of the Solar Thermal Energy Department. Throughout her career, she has worked on projects related to energy applications of solar radiation, taking part in more than 30 projects related to modelling solar radiation from satellite images, site selection of solar plants, studies of solar energy potential at regional or national level, tests characterization of components and solar systems, sensor calibration, series generation for systems simulation, and in general with the space-temporal characterization of solar radiation. She has published almost 30 original research papers, several books and monographies as well as over 60 participations in international conferences. Lourdes Ramirez has been appointed representative of CIEMAT in several international expert committees such as the International Electro-technical Committee, the International Energy Agency or the Implementation Group of Atmosphere (GMES), having been invited to research stays at Ecole des Mines de Paris (France) and at CSIRO (Australia). She is currently Senior Research at CIEMAT and also collaborates with the International University of Andalusia and with University Carlos III of Madrid teaching the Characterization of Solar Radiation for Energy Application, and has supervised more than 10 PhD and Master thesis.